Red-legged Partridge – 1 seen at – Torbreck 19th; Achmelvich Bridge 21st; Raffin 26th and Stoer 28th May. Would seem someone has released one or more of these introduced game birds so keep a look out. Photo on Gallery-Birds. Whimbrel – 6 at Clachtoll 25th May (Andy Summers). Ring Ouzel – 3 pairs on the SW slopes of Canisp 24th May (Andy Summers). Sand Martin – 2 excavating burrows at Achmelvich 23rd May (Andy Summers). Red-rumped Swallow – 1 male resting in garden Duartbeg, 20th May (Rona Burton). This is not an Assynt record, sadly, but this vagrant Swallow from south Europe shows that it is always worth having a look at the more ‘common’ birds as you never know what is around; it may well have passed through Assynt so if you saw it let us know!! Field Club member Rona has sent a superb photo of this bird which you can have the pleasure of viewing on Gallery-Birds, enjoy. Long-tailed Skua – 8 past Stoerhead Lighthouse and 5 past Clachtoll, 19th May (D and A Haines). A rare passage migrant in Assynt and at this time of year their tail streamers are really obvious. Turnstone – 32 Bay of Culkein, 17th May (D and A Haines). A good number of these passage migrant birds were in breeding plumage and looked quite stunning – see photo on Gallery-Birds. 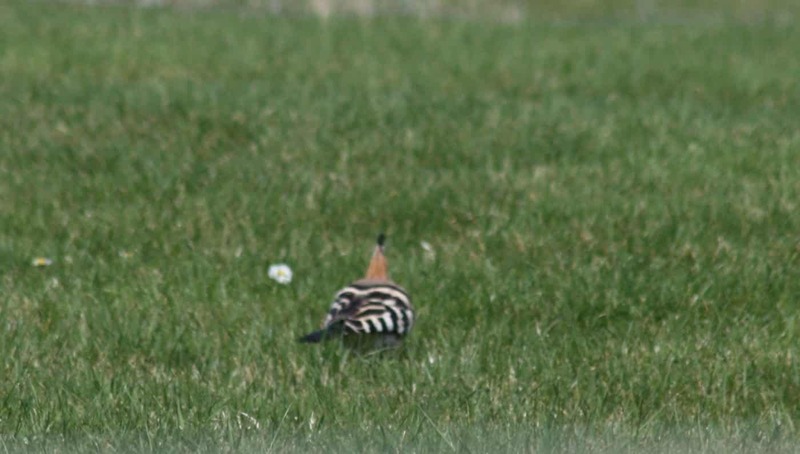 Hoopoe – Still in same garden at Clashnessie with several Whimbrels, 9th May, 3pm, (Andy summers). Hoopoe – 1 in garden north of Clashnessie bay, 8th May, 7pm, (Roz Summers, Stevan Lockhart, Andy Summers) presumeably same bird as this morning. Hoopoe – 1 in garden Nedd, 8th May, 10am (John Ross and two others). These birds make an occasional appearance in Assynt as they are noted for overshooting their normal breeding areas in europe and the stronger southerly winds recently may have caught this one out. Great-Northern Diver – 1 showing really well in full summer plumage close in to shore in Lochinver bay, 8th May (Andy Summers). Still there 10th May. Black-throated Diver – 2 Lochan an Ais, opposite Knockan Visitor Centre, 8th May (S. Beavan and B. Heckford) Just outwith Assynt but too good to not mention. Minke Whale – 1 off Stoerhead Lighthouse, 28th May (Leigh Sedgley) Our first minke this year which is quite late, possibly due to colder weather? 4-spot Chaser Dragonfly – Oldany 25th May (Andy Summers). Painted Lady Butterfly – 24th May (Andy Summers). St Mark’s Fly – Clachtoll 24th May (Andy Summers). Common Carder Bumblebee – first record for the year at Clachtoll, 17th May (Andy Summers). Horse Leech Haemopis sanguisuga – Several in garden pond Badnaban, 10th May (L and L Pearce). See photo on Gallery-Invertebrates non-insect. Green-veined White Butterfly – Clachtoll campsite, 7th May (Andy Summers).